Niflheim ("Land of Mists") is the realm of ice and cold in Norse mythology, whose frigid environs provide a final resting place for the dishonored dead. Hel, the grim giantess whose rules over the deceased, also makes her home here. This dreary description can be fruitfully contrasted with the glorious atmosphere of camaraderie and revelry awaiting warriors in Valhalla. 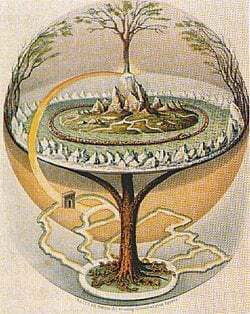 In a cosmological context, Niflheim is important for two reasons: first, it provides a site for one of the world tree's roots (Yggdrasill) to be anchored; second, the icy realm is seen as one of the primordial sources of creation, as its frigid mists were thought to have combined with fiery gusts from nearby Muspellheim to congeal into the first living beings. As one of the major realms in the Norse cosmology, Midgard belonged to a complex religious, mythological and cosmological belief system shared by the Scandinavian and Germanic peoples. This mythological tradition developed in the period from the first manifestations of religious and material culture in approximately 1000 B.C.E. until the Christianization of the area, a process that occurred primarily from 900-1200 C.E. Within this framework, Norse cosmology postulates a universe divided into nine interrelated realms, some of which attracted considerably greater mythological attention. Of primary importance was the threefold separation of the universe into the realms of the gods (Asgard and Vanaheim, homes of the Aesir and Vanir, respectively), the realm of mortals (Midgard) and the frigid underworld (Niflheim), the realm of the dead. These three realms were supported by an enormous tree (Yggdrasil), with the realm of the gods ensconced among the upper branches, the realm of mortals approximately halfway up the tree (and surrounded by an impassable sea), and the underworld nestled among its roots. The other realms included Alfheim, world of the elves; Svartálfheim, home of the dark elves; Nidavellir, world of the dwarves (tiny men who were incomparable miners and goldsmiths), Jotunheim, world of the Jotun (giants), and Muspelheim, the hellish fire-realm that was home to Surt, a flame giant who would fight against the Aesir at Ragnarök. Before venturing into an exploration of the Norse underworld (as attested to in various mythic sources), it is necessary to acknowledge that these sources are not entirely consistent in their usage of terms. More specifically, the terms Niflheim ("dark world" / "fog world") and Niflhel ("dark hell" / "fog hell") are used interchangeably in various sources, and both are occasionally used to describe the abode of Hel, the queen of the underworld and ruler over the spirits of the dead. As Lindow suggests, "the confusion between Niflheim and Nifhel is neated summed up by variation in the manuscript of Snorri's Edda. In describing the fate of the giant master builder of the wall around Asgard, two of the four main sources say that Thor bashed the giant's head and sent him to Niflheim, and the other two say that Thor sent him to Niflhel." Given this uncertainty, the following analysis will examine mythic source materials related to both Niflheim and Niflhel (noting that the first term is only explicitly utilized in Snorri's Edda). It was many ages before the earth was shaped that the Mist-World [Niflheim] was made; and midmost within it lies the well that is called Hvergelmir, from which spring the rivers called Svöl ["Cool"], Gunnthrá ["Battle-pain"], Fjörm ["Rushing"], Fimbulthul ["Mighty-Speaker"], Slídr ["Dangerous"] and Hríd ["Storm"], Sylgr ["Slurp"] and Ylgr ["She-wolf"], Víd ["Wide"], Leiptr ["Flash"]; Gjöll ["Scream"] is hard by Hel-gates. This quotation, by discussing Niflheim's existence in the "many ages before the earth was shaped," clearly evidences the realm's relevance to Norse creation accounts, a correspondence that is considered in detail below. The passage above, in addition to its relevance in detailing the relationship between Niflheim, Hvergelmir and Yggdrasill, also introduces one of the chief denizens of the frozen realm: the Nidhogg ("Malice Striker"). There the cursed snake | tears dead men's corpses. The final important dimension of Niflheim is as the realm of Hel, the queen of the underworld. This view is developed in Snorri Sturluson's account of Hel's banishment from Asgard, where he suggests that Odin cast the grim giantess "into Niflheim, and gave to her power over nine worlds, to apportion all abodes among those that were sent to her: that is, men dead of sickness or of old age." In this account, the great Icelandic syncretist develops a systematic relationship between the classic Norse understandings of Hel (the posthumous destination for the souls of the deceased), Niflhel (a term that was either synonymous with Hel's realm or that represented a deeper, more unpleasant level of the underworld), and Niflheim (an all-encompassing descriptor for the entirety of the underworld). Specifically, he uses the terms "Hel" and "Niflheim" as functional equivalents, and purposefully adopts the second definition of "Niflhel" (as a particularly odious realm of posthumous punishment). This view, which describes Niflhel as a ghastly "sub-basement" of Hel reserved for certain misfortunate souls, affirms Hel's ability "to apportion all abodes" to the deceased (as promised by Odin). This process is evidenced in the Prose Edda, where "evil men go to Hel and thence down to the Misty Hel [Niflhel]; and that is down in the ninth world." Commenting on this, Turville-Petre suggests that, in constructing this interpretation, "Snorri seems here to be drawing on a passage in the Vafthruthnismol (str. 43), where it is said that men die from Hel into Niflhel." In this way, he implies that the elemental being somehow congealed from the frosty waters of Elivagar ("storm-waves"), a term that seems to depict the confluence of rivers that emerged from Hvergelmir. While this provides a more detailed picture of the cosmic genesis, it still leaves many elements unexplored and many questions unanswered. Ginnungagap, which faced toward the northern quarter, became filled with heaviness, and masses of ice and rime, and from within, drizzling rain and gusts; but the southern part of the Yawning Void was lighted by those sparks and glowing masses which flew out of Múspellheim. ... Just as cold arose out of Niflheim, and all terrible things, so also all that looked toward Múspellheim became hot and glowing; but Ginnungagap was as mild as windless air, and when the breath of heat met the rime, so that it melted and dripped, life was quickened from the yeast-drops, by the power of that which sent the heat, and became a man's form. In this way, the frigid cold of Niflheim was central to the creation of the mortal realm. The home where dead men dwell." All links retrieved June 22, 2007. ↑ Vivian Salmon, "Some Connotations of 'Cold' in Old and Middle English," Modern Language Notes 74(4) (April 1959): 314-322. ↑ Snorri Sturluson, Gylfaginning V, Brodeur 16. Translation of river names from Lindow (189) and Orchard (136). See also "Grimnismol" (26) for an earlier discussion of Hvergelmir from the mythic corpus. The Poetic Edda, 94. ↑ Snorri Sturluson, Gylfaginning XV, Brodeur 27. ↑ "Grimnismol" (35) in the Poetic Edda, 98-99: Yggdrasil's ash | great evil suffers // Far more than men do know; // The hart bites its top, | its trunk is rotting // And Nithhogg gnaws beneath. ↑ "Völuspá" (39) in the Poetic Edda, 17. ↑ Gylfaginning LII, Brodeur 82. ↑ Snorri Sturluson, Gylfaginning XXXIV, Brodeur 42. ↑ Dubois takes this multi-partite understanding as evidence that "the general idea of multiple otherworlds for the dead appears to predate contact with [Christianity]" (81). ↑ Snorri Sturluson, Gylfaginning III, Brodeur 16. ↑ Völuspá" (3) in the Poetic Edda, 4. ↑ "Vafthruthnismol" (31) in the Poetic Edda, 77. ↑ Snorri Sturluson, Gylfaginning V, Brodeur 17. This cosmological schema (cold/wet meeting hot/dry and generating life) is discussed from a cross-cultural perspective in Bruce Lincoln's "The Center of the World and the Origins of Life," History of Religions 40(4) (May 2001): 311-326. ↑ Richard L. Auld, "The Psychological and Mythic Unity of the God, Odinn," Numen 23(2) (August 1976): 145-160. ↑ "Vafthruthnismol" (43) in the Poetic Edda, 80. ↑ "Baldrs Draumr" (4) in the Poetic Edda, 196. Auld, Richard L. "The Psychological and Mythic Unity of the God, Odinn." Numen 23(2) (August 1976): 145-160. Lincoln, Bruce. "The Center of the World and the Origins of Life." History of Religions 40(4) (May 2001): 311-326. Sturluson, Snorri. The Prose Edda. Translated from the Icelandic and with an introduction by Arthur Gilchrist Brodeur. New York: American-Scandinavian foundation, 1916. Available online. This page was last modified on 2 April 2008, at 13:11.